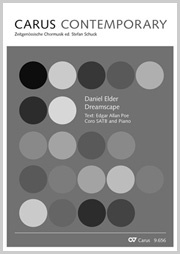 Since the release of his first two compositions, works by the young American Daniel Elder have won many prizes. The well-known text “Verbum caro factum est” from the first chapter of St John’s Gospel is the basis for this short, but exceptionally atmospheric and expressive composition. The word of God is set as a message which has held its truth since the beginning and will continue to illuminate our world in the future. Over leaps of a bare fourth which sound like little bells in the three upper voices, the bass soars up twice with a minor-tonal melody, rising through almost the entire range of the voice from G to E flat’, until all the voices sing out joyfully the glory of God in a B flat major tonality. For the lines "… and dwelt among us" and "full of grace and truth" Elder finds a humble, restrained, and mysterious Palestrina-like homophony. The piece requires divisi in soprano and bass in just a couple of bars. However, the registers are always comfortable and never exceed top F in soprano and tenor, so the piece is straightforward to perform.